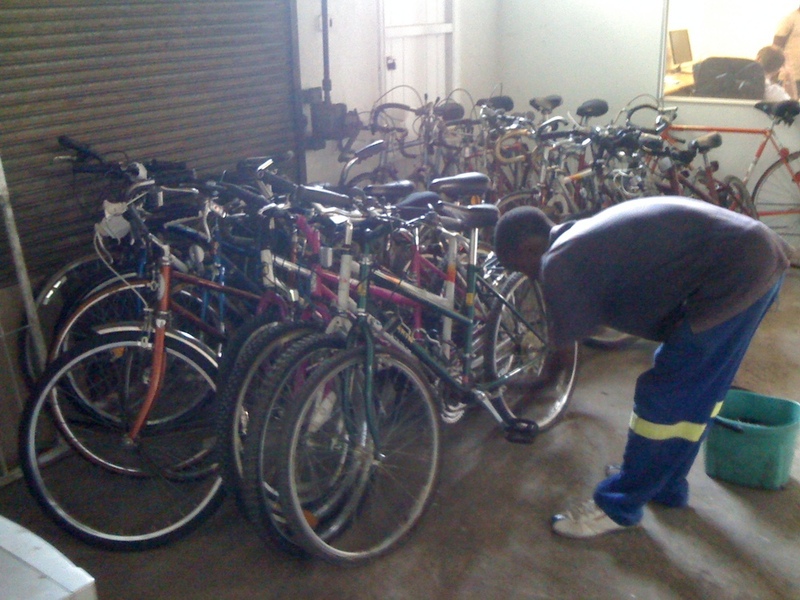 The next batch of 20 bikes (all donated by Mike's Bikes customers in California) for the kids at Our Fertile Ground were all prepped, packed and ready for the journey from our facility in Gaborone down to Cape Town. We should have had plenty of time to spare before the big event, but alas, in Africa, that often doesn't mean much. True to form, the bikes sat on a truck waiting for border clearance for more than a week. The kids from the Our Fertile Ground youth program were so excited to raise funds for their camp by riding the Cape Argus. But the border delays cost so much time that the bikes were not going to arrive there before the event - finding a solution was necessary. Paul and Robert turned to Songo, a very well known bike organization near Stellenbosch, for help. Songo's group committed to loan 20 bikes for the kids to ride the Cape Argus. It was a very stressful situation for all involved, but it seems to finally worked out in the end. We're all looking forward to seeing how the 25 Fertile Ground riders do at the Argus - So very proud of all of them! Our friends at Our Fertile Ground in Cape Town can start training for the upcoming Cape Argus ride, where they'll be raising funds for their great project, centered around a youth program for kids with HIV and AIDS. The kids who want to do the ride have no bikes, so camp founder Robert Shea requested 5 bikes from our Foundation. Naturally, we obliged, and the first 5 bikes just arrived in Cape Town and have been assembled and tuned. Training can now begin for the Argus, which is fast approaching on March 10. The response and support from the other kids in the program has been so overwhelming that Robert quickly requested another bikes, which we now have en route from our most recent container of donated bikes in Botswana. Robert and his family have such an amazing and selfless program at Our Fertile Ground, and we're honored to be a part of it. Robert Shea is one incredible guy (from right here in NorCal no less), and he has embarked on one incredible journey - to improve the lives and ease the burden of South African children living in the townships with HIV and AIDS. As Robert's wife puts it so clearly: "Being poor is bad - being poor and ill is worse - being poor with HIV is really unpleasant." So through their own nonprofit, "Our Fertile Ground", they provide supportive community environments where HIV-positive kids can thrive. They've been operating free residential and day camps on rented land for years, and their ultimate goal is to purchase a piece of property near Cape Town where they will set up a permanent camp for the youth programs. It's the kind of selfless energy and generosity that truly inspires, and when Robert reached out to us for bikes for the camp kids to raise money by riding the Cape Argus, we agreed immediately. Cape Argus is the largest timed cycling event in the world, and the project is currently seeking financial sponsors for their riders to help fund the purchase of the new camp land. Our first donation was 5 bikes, but by their gratitude, you'd have thought we gave them 500. They've since recruited another 5 riders, so our partners in Botswana are sorting out how to get 5 more bikes down to Cape Town. Once their new permanent camp is secured, Robert intends to open a Mike's Bikes Sister Shop where the kids will learn valuable skills like entrepreneurship, accounting, customer service, and bike mechanics - training that is completely unavailable from their schools and their family situations. The proceeds of the Sister Shop will provide jobs and fulfillment for the kids, and will benefit the greater Fertile Ground camp project. It's an interesting twist on the Sister Shop program, and one that we're very excited about. We're proud to be partnering with Robert and his family and his organization, and we hope to report soon on the establishment of this new Sister Shop in South Africa. "When my brother Todd died in December 1996, I inherited his mountain bike. It's actually too small for me and I only rode it for about two years. Since then, it's been sitting in my garage. Thanks to Mike's Bikes, Todd's bike is going to be spruced up and refurbished (as needed); then it'll be shipped to Africa in a cargo container with a whole lotta other bikes. Someone in Africa who doesn't have any other mode of transportation than their own feet will be getting Todd's bike. And it will change their life. I don't need a physical object to remember my brother. Todd is always in my heart. And his incredible generosity that was such a part of his spirit will continue to exist. It's time for me to let go of a "thing" and let it help someone else." Ananda, we're honored to accept Todd's bike, to pass it along to change a life in Africa, and to have shared in your memory of your brother. HIV and AIDS still finish first as the leading causes of manageable pain in South Africa, with over 5.5 million people HIV positive. AIDS Ride South Africa consists of men and women of all ages and of all nationalities, infected and affected, cycling together to raise funds and awareness about issues and concerns to HIV and AIDS positive individuals in South Africa. We were honored to provide support through our partners in Gaborone, Botswana and donate a batch of bikes and equipment (5 bikes, 20 pairs of gloves, 20 pairs of shorts, 20 helmets, 20 pumps, 40 jerseys) to enable a group of local riders to do the ride from Johannesburg to Cape Town. If you remember, one of the major goals of this trip was for us to get a better understanding of what Rob and Andrew are dealing with in the South African market and then to see the new Sister Shop distribution operation in Gaborone. We spent a couple days in Joburg, traveling around to bike shops and meeting with their owners. Through this process, we understood why Rob and Andrew are so keen on being a distributor, there’s a huge opportunity to supply that market with products that are less expensive or higher quality than what’s currently available, as well as some products that are not available at all. The combination of our market position and the existing flow of containers to the region gives Bicycle Recycle a huge competitive advantage. There are two main issues with the high-end bike market in S. Africa, the biggest being the lack of consistency in supply. It is very common for the entire country to be out of basic items like Shimano SPD pedals or 29” tubes. The other issue is that parts are very expensive due to the expense of transporting goods there. There is typically one distributor for each brand in the country, and they are generally very poorly run. They bring in a container of stuff and the country is flush for a bit, then they run dry for months while the distributor waits for more product. With our assistance, Bicycle Recycle feels they can beat their competition in both of these situations. So after spending this last week with Rob, we feel we’ve come up up with a pretty cool distribution model that is sustainable and achieves multiple goals. Recycle can get ProBike to cooperate and supply their Gaborone warehouse. These bikes and parts are then passed through to the Sister Shops with no additional mark up. You might be asking what’s in this for them, and why they would go to such trouble and expense for us. For one, they just truly believe in the Sister Shop project and they want to help it succeed. But also, they’re now the BikeSmart distributor for South Africa. They feel that our line of accessories could be very successful there, so they will be selling it to shops across the country. They already have placed it in two high-end shops in Joburg and Cape Town, and so far the shops are very happy with it. We are also working with a couple of our vendors in the US who don’t have any distribution in S. Africa. Through our relationship with Wilier, Bicycle Recycle is also now the exclusive S. African distributor for one of the best bike brands in the world. We will continue to help Bicycle Recycle build out a portfolio of brands that will be among the best in the country, and in exchange we achieve our goal of creating a sustainable supply chain of bicycles to a part of the world that could really benefit from it. Pretty cool, huh? What's the Purpose of our 2011 Trip? We have two goals on this trip to southern Africa. First is to go to Lesotho, pronounced “Lesutu”, and meet with Tumisang (Tumi) Taabe, our next Sister Shop entrepreneur and THE bike guy in Maseru, the capital city. Lesotho is a small, mountainous country completely surrounded by S. Africa. The second part of this trip is to meet with our new partners, Rob and Andrew Carle, and improve and develop our bike distribution system for the existing Sister Shops. Rob is our guide and will be taking us to Maseru for a couple days, then up to Johannesburg for the weekend and finally up to Gabs to see Bones and the plan for distribution, which will be based there. The distribution plan is the next evolution of our Sister Shop program. Having successfully opened three shops over the last several years, we’ve passed the hurdle of how to get a shop up and running. The issue now is a lack of supply of parts and replacement bikes. Our original plan was to set up a supply chain of parts from existing regional distributors, but we underestimated the difficulty of both small quantity shipping and remote payments for goods within southern Africa. Milton in Zimbabwe can’t just pick up the phone and order more tubes and brake pads. And now that their shops are set up, they can’t handle an entire container of 500 bikes. 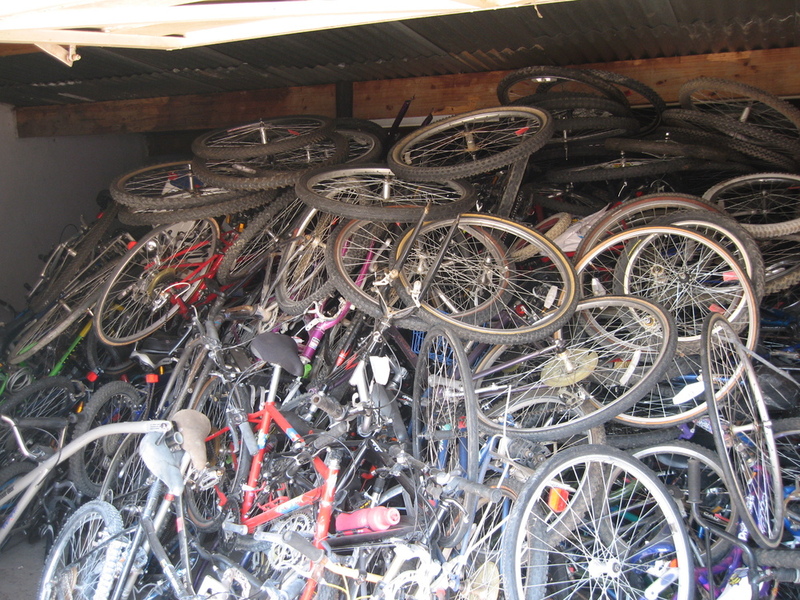 They don’t have the space to securely store that many bikes, and they don’t have the funds available to make a meaningful contribution toward the shipping and duty expenses, which is a key part of our long term goal of sustainability. It has become clear to us that a central distribution point that allows each shop to “order” in manageable amounts is what is needed. That is where Rob and Andrew come in, and they have been totally integral to setting this up. They own and operate a trucking company with warehouses in Joburg and Gaborone. Part of their business is to bring goods into S. Africa and distribute them all over southern Africa from both warehouses and to the same countries where we have Sister Shops. They both also happen to be serious MTB fanatics and they share a strong belief in our cause. Rob lives in Gaborone and has been invaluable in assisting Bones and Jerry with business practices at JonMol, and he has helped formulate this plan for central distribution of donated bikes, which we believe to be the first of its kind. In addition, over the last couple years, Rob and Andrew have become frustrated with the severe lack of supply of high-end bikes, components, and accessories in Botswana and even South Africa. So they decided to start their own bicycle distribution company, Bicycle Recycle Botswana, as an ancillary business to their main trucking and distribution operation, and they’re starting to serve the shops they frequent in Joburg and other parts of S. Africa. The magic of our relationship is that they are willing to treat our Sister Shops as their customers, but not mark up any of the goods passed through to them. Further, the profit that Bicycle Recycle makes on their high-end goods helps to pay for the overhead they spend supporting the Sister Shop sales and assistance. More details to come soon on how this new model works and why it’s awesome! I have just uploaded a few new photos to a post, click here if you want to see them. Every time I'm able to do this, I will update with a new post like this one. Matt (right, in green) and I (center in maroon) as we deplaned in Johannesburg. Obviously we were feeling pretty good to be back on the ground and walking around. Now there is just one more short flight until we're in Gaborone, Botswana. The biggest challenge at the moment is trying to find a way to be sure that our 7 boxes worth of bike shop supplies actually make the connection to the prop plane we'll be taking. We will meet Bones at his bike shop, Jonmol, immediately when we get into town tonight. As someone who has worked in five bicycle stores spanning my entire adult life, I'm anxious to see the space in person, to walk around it, breath it in, and feel what our first Sister Shop in Africa is like in the flesh. I'll be sure to post pictures both here and en masse at the Mike's Bikes Flickr page. En Route! Five Hours Down, Fifteen to Go. We're having coffee at JFK International Airport in New York City after a red-eye flight last night from San Francisco. And your author, who is not much good at sleeping on planes, has definitely made this red-eye live up to its name. Our flight to Johannesburg, South Africa leaves in a couple of hours and is a whopping fifteen hours long. Yep. Fifteen hours. Possibly longer, depending on winds apparently. Ken and Matt have been through this, but I've never been on an airplane anywhere near that long. I'd better learn to how to sleep on planes real quick, or I won't be much good to anyone once we get to Africa. The final leg of our journey to Botswana will involve a short connecting flight from Johannesburg to Gaborone, where we'll need to move quick to help Bones with his shop as we only have two days on the ground there before we head to Namibia. And the whirlwind has begun, now time for more coffee. . .